Changes the entire profile color. The profile color appears in the Autotrader grid. MD Trader also displays it as a vertical stripe in working orders. The profile color is controlled by the long horizontal bar in the Profile Setup Page. Changes the color associated with your cover orders. The cover order color is a field in the Profile Setup Page. Changes the background and text color in the Autotrader grid. Right-click the Autotrader grid to access the context menu. 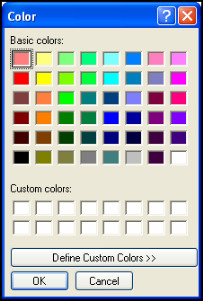 Click a color from the Basic Colors section. Click Define Custom Colors. A color palette appears. Use the palette to select the custom you want to use. Click Add to Custom Colors. The color appears in the Custom Colors section. You successfully assigned a profile or cover order color.